A new report calls for clear goals and metrics, deep distribution-grid data, and alternative economic structures to make the most of billion-dollar grid investments. The last big burst in U.S. smart grid investment was federally funded, via the Obama administration’s stimulus plan. The next big burst may soon be coming. Both the Trump administration and Senate Democrats have proposed competing infrastructure investment plans measuring from $500 billion to $1 trillion, and a leaked list of 50 proposed projects worth $137 billion included a few energy projects in the mix. 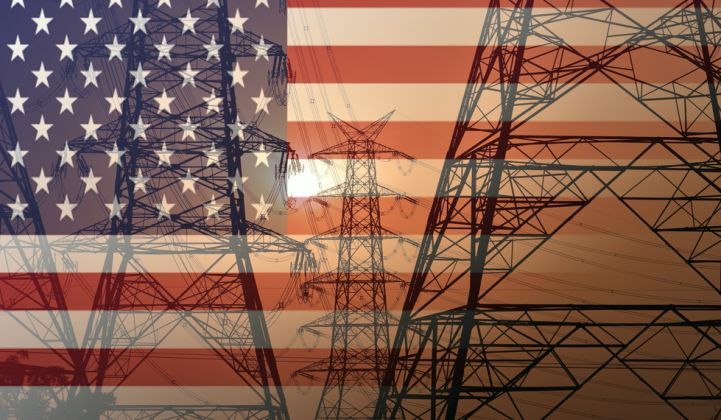 America’s Power Plan wants the proper cost and value of distributed energy to be incorporated into whatever billion-dollar grid plans may come of this infrastructure push, and it has a plan to do it. In a new paper, the nonprofit research group laid out a four-step process for utilities and regulators to choose their goals (clean energy and carbon reduction, fair and low prices for all, and utility-specific grid values) and then compare the cost of making smart grid upgrades versus not making them in order to achieve those goals. The nonprofit research group also called out for alternatives to traditional rate cases to push utilities to spend less and get more value out of grid modernization, such as conditional rates of return (holding back increases in customer rates if certain performance metrics aren’t met) or budget caps for projects. There are roadblocks to getting these measures of value implemented in utility projects. First, it requires the collecting of real data on distribution grid conditions and needs -- an expensive proposition that’s only beginning to take place in bellwether states like California, Hawaii and New York. Further steps involve regulatory hurdles once utilities start asking for new forms of IT and grid edge investment in lieu of infrastructure spending, as some want to do. But it’s going to be critical for utilities and regulators to figure out these issues to get the most out of the upcoming wave of utility investments -- and avoid any regulatory backlash against projects that might be seen as soaking the ratepayer for technology without a clear purpose and value. “It’s kind of a trend with utilities right now to be proposing grid modernization projects,” Michael O’Boyle, co-author of the report, said in a recent interview. But often enough, the projects are largely about substation upgrades, transformer replacements, or other physical infrastructure. Smart meter deployments, which are on the rise in states like Massachusetts and Illinois where they’re being mandated -- as well as with a variety of investor-owned, municipal and electric cooperative utilities that see the value in today’s technology -- are being held to different standards than the deployments of a decade ago, he said. “Smart meter rollouts are something we’ve seen done, but we haven’t seen the value yet that was promised,” O’Boyle contends. Largely speaking, utilities with full smart meter deployment haven’t seen anything like the numbers of customers they predicted would sign up for home energy management systems, or regular online interaction with their energy data, for example -- a challenge both in terms of customer and utility interest, he noted. Utilities also see infrastructure funding as an opportunity to add to their capital base, which provides them a steady rate of return from customers, as opposed to leaner, more technology-enabled solutions that provide more value for the dollar, he said. This focus can limit the utility’s incentive to seek out third-party distributed energy assets, as well as keeping it from opening up its own technology to uses it hadn’t initially envisioned, said O'Boyle. “When we’re talking about grid modernization investments, it’s such a new use of information technology, they’re capable of doing a lot of different things. Maybe it’s useful for improving reliability, or reducing operational costs by improving situational awareness on the grid. But are you also getting a better conduit for customers signing up for time-of-use rates, for peak reduction. […] Are we getting the most out of it?" Despite the overall plan’s simplicity, its first step may be daunting for many utilities -- an “integrated distribution planning” (IDP) process, “in which demand-side and distribution-level investments are considered in conjunction with bulk-system resources to achieve an optimized, integrated system.” That one sentence sums up all the complicated work being done in California, New York and Hawaii to integrate distributed energy resources (DERs) into utility grid planning, investments and operations. Likewise, the few states that have implemented the alternative economic models that America’s Power Plan is pushing for haven’t done so perfectly, he said. Illinois imposed performance metrics on the smart meter deployments of ComEd and Ameren, but they’re not particularly well designed to optimize utility incentives to think outside the box, with relatively easy tasks to complete and no opportunity for the utilities to earn more if they outperform. To avoid utilities high-balling their proposals and keeping an outside share of the savings, “the regulatory capacity to review a distribution investment plan has to be quite high,” he noted -- thus the emphasis on an integrated distribution plan to provide the data to inform the metrics that will measure success in economic, environmental and customer fairness terms.